It had been a few weeks since the Pub Night gang had hit Roots, so Lindsey and I trooped down there last night with new neighbors Bryan and Tanith, fresh off the boat from Cleveland. Lindsey was excited to have moved back to his mostly-remodeled house. OK, let's call it partially-remodeled, but at least he's back within walking distance of Roots. The weather was perfect for the sidewalk picnic tables, but we were surprised at how quiet the place was, maybe because of the holiday weekend. Anyway, the $2.50 Tuesday night imperial pints beckoned, and we heeded the call. 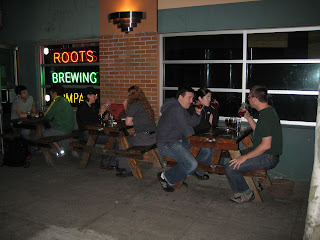 Roots has a couple of excellent beers on right now. The Farmhouse Bruin has improved a lot since it was unveiled a couple months ago at the Cheers to Belgian Beers event. It seemed a little thin at the time, and I even went back the next week and had the same impression. But last night it tasted better -- it still has that wild-yeast/saison flowery tartness, but it's richer and rounder. Is it a different batch? Or is that what a couple months in the cellar will do for you? Whatever the case, stop in and grab one before it's gone. Along the same lines, the strong Belgian Golden they're pouring right now is also a gem. This one has been good from the get-go, although it's sometimes difficult for me to spring for a delicious 10-ounce beer when I can reach out and grab a 20-ounce pint of something nearly as good. We shared one around last night, though, and it was mighty tasty. Darker in color than you'd expect a "Golden" to be, but dangerously smooth. Maybe those little glasses are a good idea after all. Of course, the reliable standbys were on tap, too: Island Red, Woody IPA, Nevermined Pale Ale, Burghead Heather Ale, and the Imperial Stout. There's also an ESB out right now, but they were out of it last night. Burghead always seemed like a weird idea -- no hops? -- but now that everyone is losing their minds over the hop crisis we can see that it was really an idea that was ahead of its time. The one thing I miss at Roots these days is having a selection on cask -- it's been many months since I've seen the engine hooked up. Seeing no signs of the promised pub remodel, I asked the bartender Jim about it. His impression is that it's on the back burner for now. It would be nice to have a better use of the space in there, but really the beer is the bottom line. If Roots keeps cranking out the good stuff, we'll put up with the bad feng shui.